Ford Motor Company has innovation tightly woven into its corporate fabric. Henry Ford’s invention and perfection of the assembly line ushered in mass production and the Second Industrial Revolution. However, the latest innovations coming out of Dearborn, Michigan, go even deeper. Mobility innovation is no longer just a question of producing transportation networks; it is also about tackling traffic congestion as the global population rises. By 2030, around 630 million people are expected live in cities with a population exceeding ten million inhabitants or more. The projections for 2050 are even more unsettling. With the earth’s population set to rise at least nine billion – and with increased prosperity levels, the number of vehicles in circulation is projected to double to two billion or more. The issue stretches beyond that of productivity or the environment. Ford’s focus, some pun intended, remains on bringing viable and affordable transport to the masses. This is the business model at the root of the company’s enduring success. Amongst its many projects, Ford is now working towards lowering the affordability threshold of smart public transportation and autonomous vehicles cars, a venture which involves connecting roads, cars, parking, and most challenging of all – pedestrians. Experts predict that meeting these challenges presents a $130 billion business opportunity for the automotive industry. Ford is clearly in the running for the prize. In 2015, Ford opened a new research and innovation centre in Palo Alto, California, right in the heart of Silicon Valley. The facility is dedicated to find radical solutions that improve connectivity, mobility, and the performance of autonomous vehicles. It has since become one of the largest automotive manufacturer research centres in the valley with a staff of more than one hundred researchers, engineers, scientists, and out-of-the-box thinkers. The CFI.co judging panel is awed by Ford’s sensible forward-thinking approach to the future of mobility. As an experienced innovator, the company has claimed its rightful place at the leading edge of innovation. 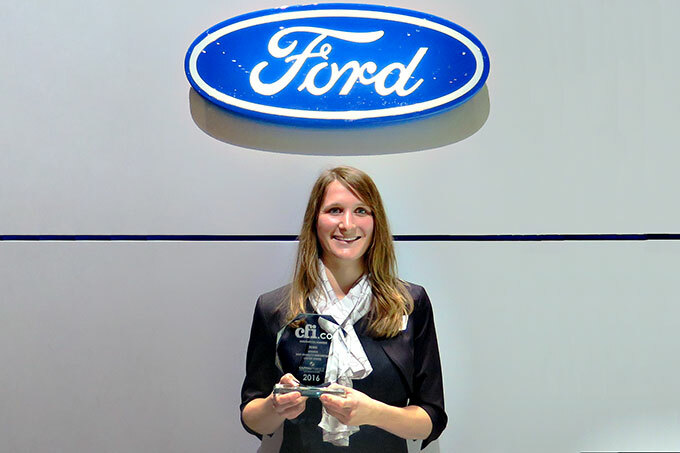 The judges are delighted to offer Ford Motor Company the 2016 Best Mobility Innovation United States Award.